Cinco de Mayo, or the fifth of May, commemorates the Mexican army’s 1862 victory over France at the Battle of Puebla during the Franco-Mexican War (1861-1867). Cinco de Mayo traditions include parades, mariachi music performances and street festivals in cities and towns across Mexico and the United States. Celebrate Cinco de Mayo in Green. 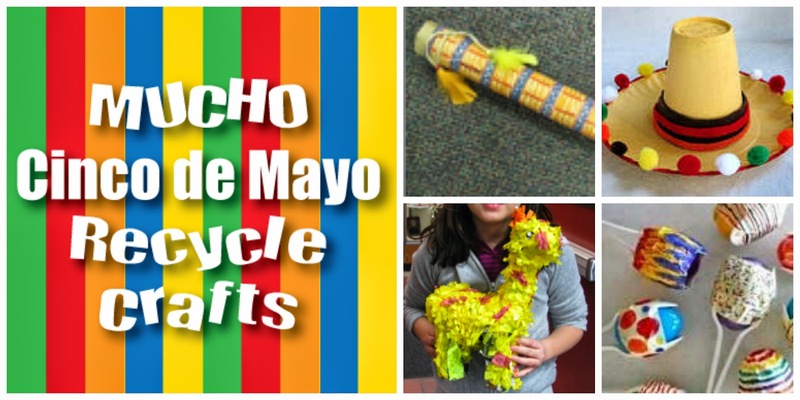 Here are some recycle craft ideas for celebrating! Watch the whole project on UTUBE! If you have been reading our blog, you know we love recycle toy ad ons. It makes for more creative play and adds an element of ingenuity and engineering to every project. In the past, we designed a Playhouse modelled after a doll house, as well as a campground using Legos, Playmobile and other small toys. 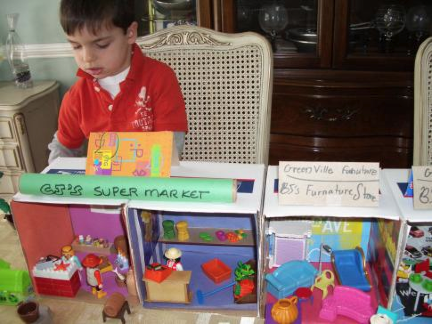 We took the same boxes from our playhouse and reconstructed them as well as added others to make a city scene. Obviously, utilizing what toys we already have. 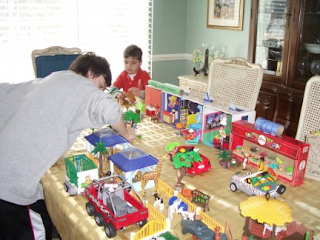 The city includes a supermarket, furniture store, cafe, fruit stand, flea market, animal petting area, zoo, walkways, sitting areas, ice cream wagon and more. We used recycle materials such as bottle caps, candy containers, pizza inserts, food boxes and cardboard tubes to make shelves, buildings and accessories. All mixed with our collection of playmobile and other small toys. Lastly, we made signs from the back side of food boxes, paper rolls and paper. The boys ages range from 5 to 9. Each one brought their excitement, creativity and expertise to the table! See our other buildings and get a free building plan. Got Boxes, Got Recycle Buildings! 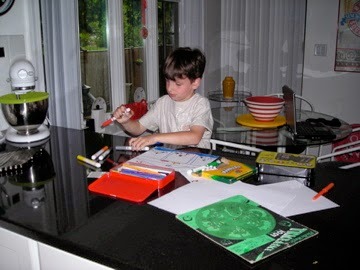 At home or at school this craft is cool! A lesson in engineering and architecture. 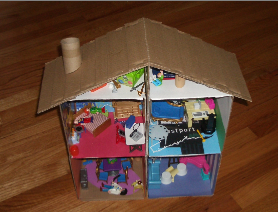 Make your very own buildings from recycled items you find around your home. *Reshape them! Make an apartment building, strip mall with stores or a one level house! 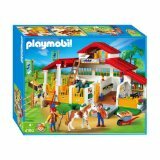 We mix this toy with Playmobile people, furniture, animals and make a whole scene for boys and girls. Easy step by step guide to starting a Recycle program at your school. Design a great recycle program in your school. If you are considering starting a recycling program at your school, there are resources available to help you. Follow these great guidelines from Recycle Works of San Mateo County when setting up a school recycling program. This comprehensive list will help you set up a functional recycling program that works. 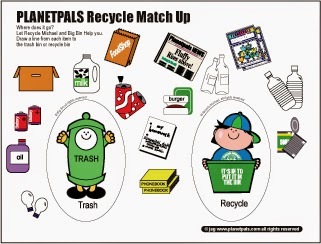 Combine these ideas with Planetpals activities and you will have a top notch program that will change your school colors to GREEN in no time. 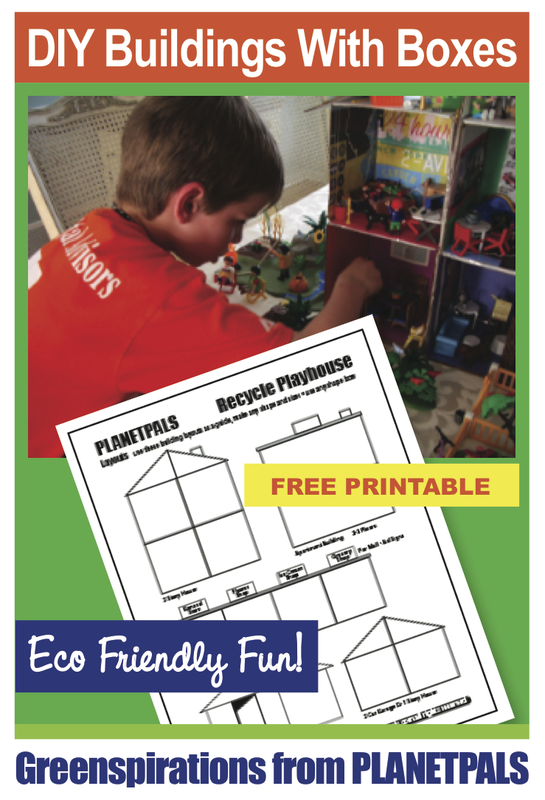 Check out Planetpals.com for recycle lessons, recycle kits to print out and put on your bins, as well as Planetpals lesson plans and downloadable craft activities. Why not do what many schools now do and have a PLANETPALS Day each week or month. 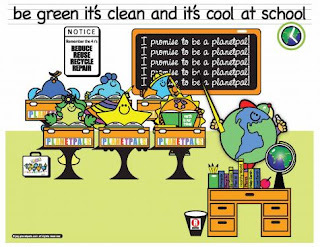 Have a GREENER School this year! Obtain top-level support from the school administration, your school district's operation and maintenance staff and your schools custodial staff. Discuss how the program can reduce costs for the school by lowering their disposal costs. Appoint a recycling coordinator, teacher, class or club to implement your program. The best teams have students, teachers, principals, administration and parents who are willing to help. Conduct a waste audit to determine waste composition and volume of materials, what portion can be recycled, re–used, reduced, or eliminated and what recyclable material could be substituted for non–recyclable materials currently in use. Ask your hauler if they will pickup your recycling or check the RecycleWorks Database for companies to provide that service. Call RecycleWorks School Recycling Programs at 650–599–1424 if you'd like help with a waste audit for your site or check out: How to Do a Waste Audit. As a team, define your goals and ensure that each member has a role. It is a good idea to choose one or two recyclables to start your new program (i.e. cardboard and mixed paper). Once your program is functioning smoothly, expand your program to include more recyclable materials. Focusing on recycling one commodity at a time allows you to work out the difficulties that may arise with contractual, collection, sorting and educational components. Team members can choose the right type of collection container such as restricted openings or slots for paper to keep the garbage out of the recyclables. For more information on containers, check the buy recycled database or call the RecycleWorks hotline at 1–888–442–2666. The team will need to determine where containers should be placed on your school sites based upon what the audit has determined. Recycling bins need to have trash receptacles next to them or your recycling containers may be used for garbage. The recycle team will empty the collection containers bins into larger containers on site so the recycling company can pick them up. Develop this collection system with your school custodial staff. If this part of the program is not managed correctly, recyclables can find their way back into the garbage receptacles. The team can create signs or contact local businesses as corporate sponsors and alert the local media of the program. Consider holding a kick–off event at your school site and perhaps tracking and graphing your recycling success to share with your students every month. Some schools collect the can and bottle containers, bring them to a local recycler and use the proceeds to purchase recycling containers, fund field trips, and or have an end–of–the–year pizza party for the recycling team. As a result of your new recycling program you will find that recyclables are being diverted from the waste stream and you are helping to keep valuable natural resources from ending up in a landfill. You may find that your school is now able to reduce the size or quantity of the waste collection dumpsters or to lower the frequency that garbage is picked–up at your school site. Not only will you save money for your school, you will be educating the next generation on the value of caring for our community and environment. Labels: how to recycle at school , recycle program for your classroom , school recycling , teaching kids to recycle. 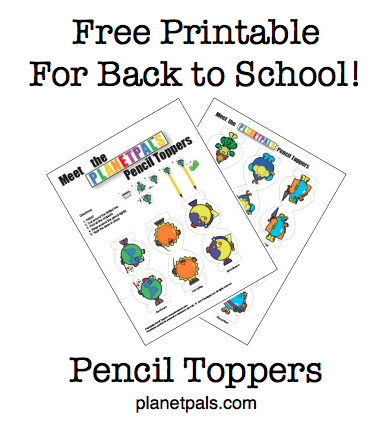 Planetpals Pencil Toppers Are Tops For Green Kids! 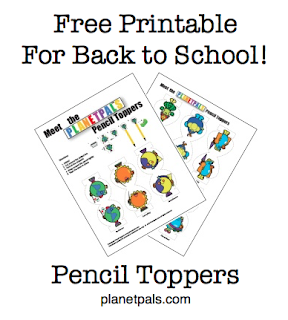 Go to Planetpals.com and download Planetpals colorful pencil toppers. It's a fun craft activity that teaches kids about the PALS and their job in the universe. 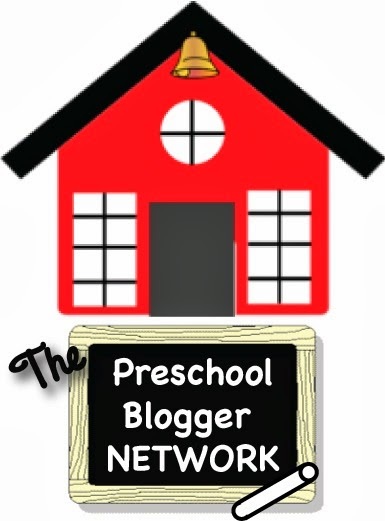 A perfect tool for preschool, homeschool, and classroom lesson plans or a unique activity just to do with your kids. 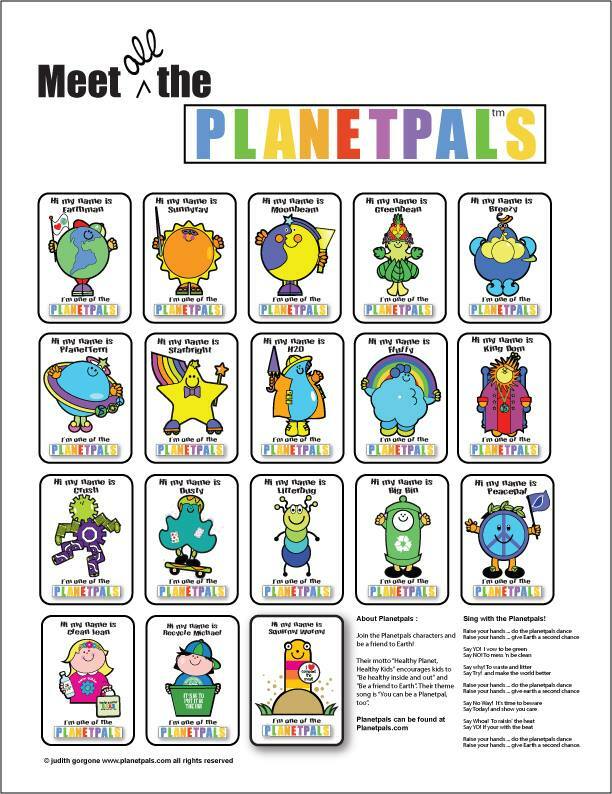 PLANETPALS earth friendly characters have proven to be an innovative way to teach kids about their world and how to care for it. 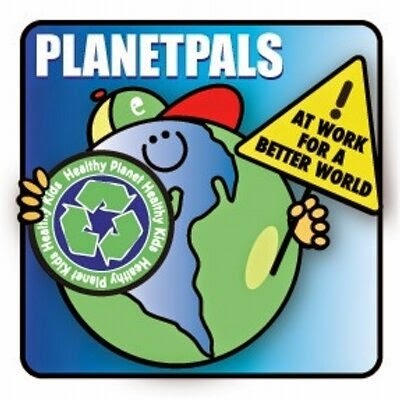 Planetpals impresses young minds with responsibility and inspiration. Each character comes with a rhyme. 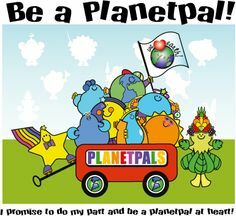 Planetpals.com is a premiere site for a better world. It's motto: Healthy Planet, Healthy Kids. Planetpals is a leader in innovative and meaningful projects and fun facts for all kids worldwide. Download this fun activity now! Spring has sprung and so have bugs! Kids of all ages have a great fascination for bugs, insects, spiders, and all other sorts of creepy crawlies. 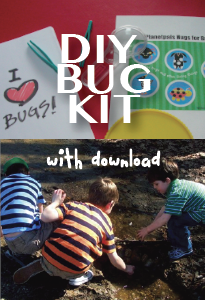 Create an inexpensive bug keeper learning kit from items around the house and inspire kids to discover more about their natural world. 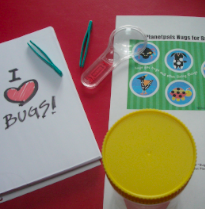 Planetpals Recycle BUG Kit activity comes with a lot of ideas and a printable "hugs for Bugs" label for the journal or jar. It also includes ideas to make a recycle bug jar and make a butterfly net from recycled materials. 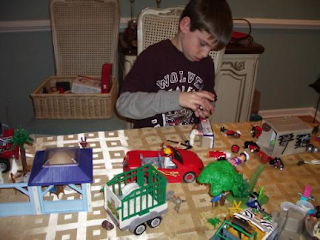 Do all three activities and you will have one big lesson about nature's smallest creatures. It will encourage kids to find fun facts like "Houseflies find sugar with their feet, which are 10 million times more sensitive than human tongues" and "While gathering food, a bee may fly up to 60 miles in one day", then jot them in their journal. For younger children have them collect pictures of bugs. Land or sea, studying creatures are a great fascination. 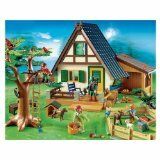 Check out the Recycle BUG Kit at Planetpals.com. This download activity is printable and taylor made for you. Planetpals, we love Earth everyone and everything on it! We hope you will, too. 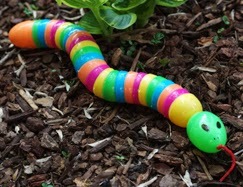 A great green way to recycle those Plastic Easter Eggs, because you know plastic does not biodegrade. Get this free craft instruction. This is one of our very first crafts on Planetpals.com. It's a lesson in engineering as well as a lesson in the 3 R's. 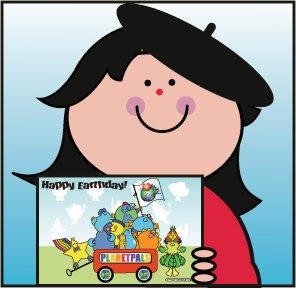 Planetpals Greatest Earthday Pages Ever is loaded with activities, fun facts and games for kids and families. 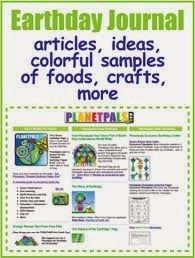 Teachers love Planetpals in the classroom and mom's love it at home. With thousands of teacher and parent members on FB alone, we have compiled a Recycle Crafts Series to run through Earthday. It will include links to Planetpals exclusive craft ideas as well as feature Planetpals favorite recycle craft ideas and instructions. Ideas that are simple, unique and easy to do for every age group and perfect for home activities, homeschool and the classroom. We scoured all our sources to bring the best of the best! GREEN. That's what we are every day of the year. So, join Planetpals on Twitter, Pinterest or Facebook. Don't miss one green thing! Order Planetpals activity books: The Earthday Everday Book, The teacher Book, The Coloring Book. Planetpals: The best place on Earth to learn about Earth! 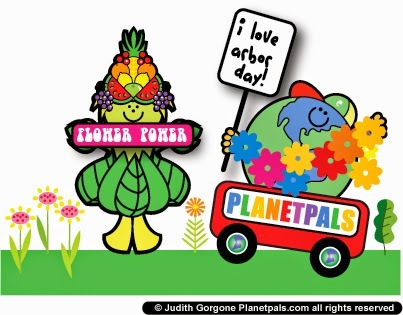 What can you for Arbor Day? Happy Earthday To All Our Pals! Have a green day, week, year. You can be a Planetpal, too! Test yourself with the help of Big Ben and Recycle Michael! How much do you know about recycling and trash? What goes where in your town? April 22, is Earth Day. Every Year as Planetpals, we want to celebrate in a special way! 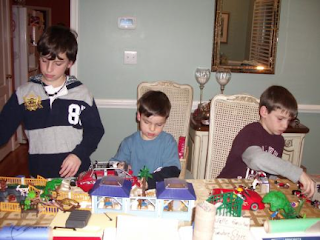 We took a look back at some of our Earthday activities with family. As you can imagine, we have found many ways to celebrate through the years. Everything from making recycle crafts and foods, to attending Earth Day celebrations and a simple walk in the park. By far our favorite Earthday was a walk in the park We started our day doing recycle crafts from odds and ends that we had collected. We made earth globes from tuna cans and bottle tops and robots from various other recycled materials (of course)! Later, we packed a healthy picnic and headed to the Boston Common to enjoy the wonders of springtime. It's not complicated to teach kids to love Earth and care for their world. Basic things like learning about flowers, trees and animals can make a lasting impression on children. Taking a walk and spotting litter can lead to dialog about responsibility. Every step can lead to an adventure in learning, and on Earthday, we wanted it to be about Earth. Our Earthday did just that. No Earthday cake, No Earthday parade, No big crowd. Just us PLANETPALS partaking in our beautiful world. Learning to love it. Learning to care for it. Learning to create it. Make Tuna Can World Globe:Planetpals Exclusive! How to Have an Swap Meet and Be a Planetpal, too! How Green Does Your School Garden Grow? Earthday Can Be So Sweet!